Polyesteramides having amino acid-derived groups alternating with hydroxy acid-derived groups are useful in making shaped articles, particularly, shaped articles suitable for use as surgical devices. Polyesteramides with amino acid-derived groups alternating with alpha-hydroxy-derived groups and methods for their preparation are described herein. From the polyesteramides are molded shaped surgical devices. Polyesteramides are polymers containing both ester linkages and amide linkages. Their significance for technology of surgical devices stems from the fact that the susceptibility of their ester linkages to hydrolysis confers upon them the ability to be eventually absorbed, or resorbed by a body into which they have been implanted and their amide linkages confer upon them the desirable mechanical properties characteristic of polyamides. Fiber-forming polyesteramides obtained from the single stage reaction of approximately equimolar amounts of a monoalkanolamine and a dicarboxylic acid are known from U.S. Patent No. 2,386,454. Polyesteramides indicated to be useful for the manufacture of absorbable sutures and other surgical devices are disclosed in U.S. Patent No. 4,226,243 as obtained from the reaction of a bis-oxyamidodiol (itself derived from the reaction of diethyl oxalate with a monoalkanolamine such as ethanolamine) with a dicarboxylic acid ester. See also US-A-3,773,737 (and its re-issue patent 30,170) U.S. Patent No 4,343,931 discloses absorbable surgical devices manufactured from polyesteramides obtained by reacting a diamine with lactic or glycolic acid to produce a diamidediol, which is then reacted with a bischloroformate or a compound selected from the group consisting of dicarboxylic acids, diacidchlorides and dicarboxylic acid anhydrides. Nylon refers to a family of high strength, resilient synthetic materials, the'long chain molecules of which contain recurring amide groups. Articles fabricated from nylon have been widely accepted for a variety applications. Certain surgical applications, however, require a surgical device that is bioabsorbable. Nylon is not bioabsorbable and is therefore unacceptable in such circumstances. It would be desirable to provide a molded surgical device that has strength and resiliency characteristics similar to those of nylon, but which is bioabsorbable. It has now been found that polyesteramides having amino acid-derived groups alternating with hydroxy acid-derived groups are useful in making shaped articles, particularly, shaped articles suitable for use as surgical devices. where x is an integer from 1 to 6; and alpha-hydroxy acids, such as, for example, glycolic acid. The method of making the present polyesteramides involves blocking the amino group of the amino acid, reacting with an alpha-hydroxy acid, removing the blocking agent and then polymerizing to form the polyesteramide. The resulting polyesteramide can be bioabsorbable and can be formed by molding into shaped articles. Particularly useful shaped articles include surgical implants. wherein x is an integer from 1 to 6 and R can be the same or different at each occurrence and is individually selected from the group consisting of hydrogen and C1 to C4 alkyl. where x is an integer from 1 to 6. Preferred amino acids are those wherein x is 1 or wherein x is 5. The first step in making the polyesteramide is to block the amino group of the amino acid. This will ensure that subsequent chlorination and reaction with the alpha-hydroxy acid occurs only at the acid group of the amino acid. Introduction of a blocking agent onto the amino group can be accomplished using any of the techniques known to those skilled in the art. Suitable blocking agents include benzyl chloroformate. Benzyl chloroformate can be reacted with the amino acid in the presence of a metal oxide (e.g., MgO) in an ice bath of an aqueous ether solution. The protected amino acid is then converted to an acid halide. This can be achieved, for example, by refluxing the protected amino acid with SOX2 wherein X is F, Cl, Br or I in methylene chloride. wherein R can be the same or different at each occurrence and is individually selected from the group consisting of hydrogen and C1 to C4 alkyl. Glycolic acid is the preferred alpha-hydroxy acid for making the polyesteramides described herein. The reaction of the acid chloride with the alpha-hydroxy acid can be carried out by refluxing in the presence of an inert diluent such as, for example, DMF and a tertiary amine, such as, for example, triethylamine (TEA). The blocking agent is then removed from the acid chloride using techniques known to those skilled in the art. For example, if benzyl chloroformate is used as the blocking agent, the blocked acid chloride can be reacted with HBr in acetic acid to remove the blocking agent. where x and R are as defined above. The monomer should be purified, preferably to at least about 98 percent purity. The monomer may be purified using any known technique such as multiple distillations and/or recrystallizations. 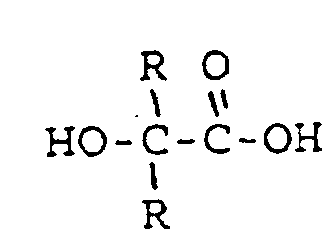 The monomer is polymerized by heating to produce a self-condensation reaction. For example, melt polymerization of the monomer prepared from glycine and glycolic acid can be achieved by heating to around 240 degrees C.
If desired, any portion of the above-described amino acid/ester monomer employed in the polymerization reaction, e.g., from about 1 to about 99 mole percent can be replaced with a like mole percentage of another difunctional, self-condensing comonomer. Such monomers include compounds containing both an acid group and a second active group such as a hydroxy group, an amino group or a second.acid group. Thus, by way of example, suitable comonomers include, hydroxycarboxylic acids, diacids and amino acids. The polyesteramides of this invention, defined in claim 1 below, can be formed into surgical articles using any known technique, such as, for example, extrusion, molding and/or solvent casting. The polyesteramides can be used alone, blended with other absorbable compositions, or in combination with non-absorbable components. A wide variety of molded surgical articles can be manufactured from the polyesteramides described herein. These include but are not limited to clips and other fasteners, staples, pins, screws, prosthetic devices, wound dressings, drug delivery devices, anastomosis rings, and other implantable devices. Optional additives which may be present in compositions made from the polyesteramides described herein include plasticizers, release agents and other processing aids. Where the composition is used to make a surgical device, stearic acid or calcium stearate are particularly useful additives due to their biocompatiblity. The moldings containing the polyester amides described herein can be of reinforced composites. Thus, for example, the polyesteramide composition can form the matrix of the composite and can be reinforced with bioabsorbable or non-absorbable fibers or particles. Alternatively, a matrix of any bioabsorbable or non-bioabsorbable polymer composition can be reinforced with fibers or particulate material made from compositions containing the polyesteramides described herein. 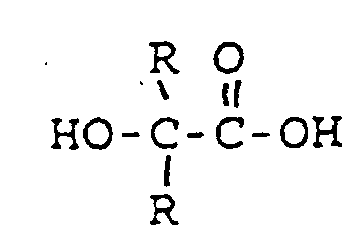 In an alternative embodiment, in a molding composition, the polyesteramides described herein are admixed with a filler. The filler can be in any particulate form, including granulate and staple fibers. While any known filler may be used, hydroxyapatite, tricalcium phosphate, bioglass or other bioceramics are the preferred fillers. Normally, from about 10 grams to about 400 grams of filler are mixed with 100 grams of polymer. It is further contemplated that one or more medico-surgically useful substances can be incorporated into compositions containing the polyesteramides described herein. Examples of such medico-surgically useful substances include, for example, those which accelerate or beneficially modify the healing process when particles are applied to a surgical repair site. So, for example, molded articles in accordance with the present invention can carry a therapeutic agent which will be deposited at the repair site. The therapeutic agent can be chosen for its antimicrobial properties, capability for promoting repair or reconstruction and/or new tissue growth. Antimicrobial agents such as broad spectrum antibiotic (gentamycin sulfate, erythromycin or derivatized glycopeptides) which are slowly released into the tissue can be applied in this manner to aid in combating clinical and sub-clinical infections in a tissue repair site. To promote repair and/or tissue growth, one or several growth promoting factors can be introduced into the articles, e.g., fibroblast growth factor, bone growth factor, epidermal growth factor, platelet derived growth factor, macrophage derived growth factor, alveolar derived growth factor, monocyte derived growth factor, magainin, and so forth. Some therapeutic indications are: glycerol with tissue or kidney plasminogen activator to cause thrombosis, superoxide dimutase to scavenge tissue damaging free radicals, tumor necrosis factor for cancer therapy or colony stimulating factor and interferon, interleukin-2 or other lymphokine to enhance the immune system. It is contemplated that it may be desirable to dye articles made from compositions containing the present polyesteramides in order to increase visibility of the article in the surgical field. Dyes, such as those known to be suitable for incorporation in sutures, can be used. Such dyes include but are not limited to carbon black, bone black, D&C Green No. 6, and D&C Violet No. 2 as described in the handbook of U.S. Colorants for Food, Drugs and Cosmetics by Daniel M. Marrion (1979). Preferably, articles in accordance with this disclosure are dyed by adding up to about a few percent and preferably about 0.2% dye to the resin composition prior to extrusion. wherein x·is an integer from 1 to 6 and R can be the same or different at each occurrence and is individually selected from hydrogen and C1 to C4 alkyl. A molding in accordance with claim 1, further comprising at least one medico-surgically useful compound. A molding in accordance with claim 1, further comprising a plasticizer. A molding in accordance with claim 1, further comprising a filler. A molding in accordance with claim 1, further comprising one or more bioabsorbable polymers selected from homopolymers and copolymers of glycolide, lactide, trimethylene carbonate, dioxanone and caprolactone blended with the esteramide compound. wherein x is an integer from 1 to 6 and R can be the same or different at each occurrence and is individually selected from hydrogen and C1 to C4 alkyl. f) molding the composition to shape the surgical device. where x is an integer from 1 to 6. A method in accordance with claim 9, wherein step a) comprises reacting an amino acid with benzyl chloroformate. A method in accordance with claim 9, wherein step b) comprises reacting the blocked amino acid with a compound of the formula SOX2 wherein X is selected from F, Cl, Br and I. A method in accordance with claim 9, wherein step b) comprises chlorinating the blocked amino acid. wherein R can be the same or different at each occurrence and is individually selected from the group consisting of hydrogen and C1 to C4 alkyl. A method in accordance with claim 9, wherein step c) comprises reacting the acid halide with glycolic acid. ES2239516B2 (en) * 2003-09-15 2007-06-16 Universitat Politecnica De Catalunya Process for obtaining and biomedical applications poliesteramidasderivadas glycolic acid and omega-amino acids. method for incorporating units of glycolic acidoo polyamides derived from diamines and dicarboxylic acids.